Join renowned Australian designer Lynette Anderson in a magical place where the flowers are always blooming, the bees are always buzzing, and the charms of a country cottage are just a few stitches away! Playful patchwork, applique, and embroidery transform simple projects into fanciful pieces to use, display, and cherish. Zoom in for Lynette's enchanting details: tiny prairie points, mini appliqued hearts, and petite embroidered flowers delight at every turn. Create small quilts, pillows, and pouches, plus a journal cover, pencil case, sewing caddy, and framed delights. 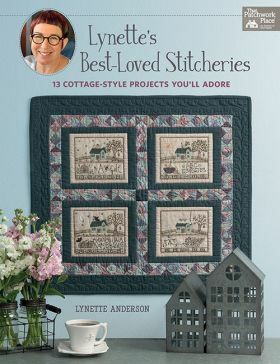 Lynette's hand-drawn watercolors round out this dreamy book, chock-full of ways to enjoy every stitch. Lynette Anderson's love affair with textiles began at a young age. She grew up in a small village in Dorset, England, where her grandmothers taught her to embroider and knit. Patchwork caught her attention 1981 after the birth of her first son. She moved with her family to Australia in 1990, which prompted the release of her first patterns in 1995. During the ensuing years Lynette has produced hundreds of patterns. Her distinctive and appealing style, which combines simple stitchery with applique and piecing, attracts stitchers worldwide. Inspired by nature, childhood events, and her beloved pets, she enjoys designing quilts, pillows, bags, and sewing accessories. Lynette's hand-painted wooden buttons and the fabric collections she has designed for Lecien Fabrics are the perfect complements to her creative style. One of her greatest passions is teaching, and she enjoys traveling the world to share her designs with her students.